Under Rule 48, registrars will dismiss five-year-old actions that have not been set down for trial without notice. The best strategy to pre-empt last minute catastrophes is to move files along in a timely manner and to set the matter down well within the five-year time limit. The longer a file drags on, the more likely expert reports will need to be updated, which can double the disbursements and eat into the client’s take-home amount. Work-in-progress also accumulates, usually without any increase in the final settlement. Witnesses may forget details as time passes, hurting the prospects of a fair trial. And haven’t we all seen this – the longer litigation goes on, the more anxious clients become. Well-managed law firms, whatever the size, have systems in place to monitor all files. 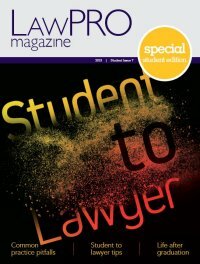 LAWPRO recommends using our Rule 48 Transition Toolkit, which you can download at practicepro.ca/Rule48. The toolkit includes a flow chart to determine, on any file, what deadlines need to be tickled. In addition, the toolkit’s checklists ensure regular reviews of all files are done by individual lawyers and/or staff. A file progress plan, contained the toolkit, is an easy-to-read document in your file that describes what the file is about. It can be reviewed within minutes, and lists all the steps that must be done in the file, including who is responsible and when it has to be done. A file progress plan is a living document that you keep on a file which contains an at-a-glance review of the whole file, including the theory of the case, the major legal issues, and a task list. Open a new file progress plan every time you open a file, and book periodic dates in your calendar to update the plan. Meet with everyone involved on the file when you update the plan. You can then deliver your instructions face-to-face, and enter tasks into the file progress plan, indicating who handles a task, when it was assigned, and when it has to be completed, for all to see. As a living document, a file progress plan is most useful when it is continuously updated throughout the life of a file. So if you haven’t already, consider changing it up. Give instructions in person. Save those instructions in a file progress plan. Say goodbye to instructions-by-email. The beauty of a properly updated file progress plan is that it can be referenced at any time during the life of a file by anyone. Putting a new associate on the file? Tell the associate to “go review the plan”. Have a law clerk who doesn’t know what to do on a file? Go review the plan. Forgotten what you had to do? Go review the plan. Preparing for mediation? Go review the plan. Have to take a hiatus from practice and transfer your files? Go review the plan. 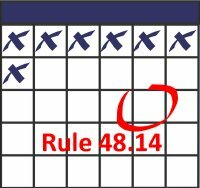 The Rule 48 changes reflect major changes to the law. While the five-year deadline gives you more time to set a matter down for trial, it will be harder to save a matter if it falls through the cracks. Don’t rely on the extended time to make things right. Take the proper steps by setting ticklers, reviewing files at appropriate intervals, and moving your files along. Use LAWPRO’s Rule 48 Transition Toolkit to help cover all the bases. With the right mindset administrative dismissals can be prevented.